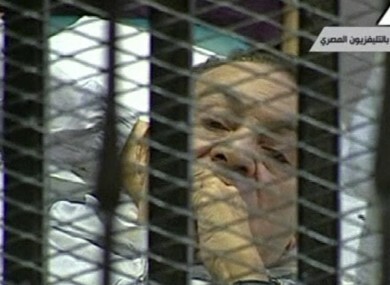 President at the start of 2011, by the years end Mubarak was on trial on a hospital bed for corruption and killing of protesters. AS THE CHICKEN restaurant Nando’s noted in its now infamous ‘Last Dictator Standing’ ad this has not been a good year for dictators. Though it featured only Muammar Gaddafi - the others were the likes of the long departed Saddam Hussein and Idi Amin - it could easily have included the likes of Egypt’s Hosni Mubarak or Tunisia’s Ben Ali. Though not dead, they are deposed with Mubarak reportedly close to death. Then of course there is Kim Jong Il whose recent death came as a surprise to many in the West who now hold new hope of brokering an agreement of some sort with the nuclear-armed nation for it to disarm or at least take that rhetoric down a notch or two. As president of Tunisia since a bloodless coup d’etát in 1987, Ben Ali could not have imagined that the actions of fruit salesman Mohamed Bouazizi would spark a series of events that would shake not only his rule but the entire Arab world. In protest at harrasment from local officials, Bouazizi set himself on fire on 17 December 2010 (he later died), a statement so shocking and appalling that it sparked an outcry against corruption and against Ben Ali’s rule. As was to be the case with other uprisings, protest were met with violence from government forces but soon a critical mass was reached whereby Ben Ali’s position became unteneable. He would later be convicted of money laundering and drug trafficking and sentenced in absentia to 35 years in prison. Bouazizi was later honoured on a postage stamp. Tunisia has since held landmark parliamentary elections. Perhaps buoyed by what transpired in Tunisia, Egyptians sought an end to Hosni Mubarak’s 30-year rule in late January and it took just 18 days for mass protests, centred on Tahrir Square, to force the increasingly beleaguered former military commander from power. The country’s military council took power initially. Mubarak went on trial while in a hospital bed but just as was the case at the beginning of the year, Egyptians are on the streets at the end of this year, protesting against the slow pace of change. There may yet be more turmoil there in 2012. The longest, most drawn-out and probably most violent of uprisings was remarkable not only for events on the battlefield between anti-Gaddafi rebels and forces loyal to the increasingly bizarre leader, but also for the way in which Gaddafi fell from grace. The Brother Leader’s Green Revolution may have been ideologically at odds with the West but the US and others appeared happy for him to stay in situ. That was until it reached a point where the violence became so abhorrent to the West that an unprecedented NATO no-fly zone was imposed. Gone just over two months ago, it’s not entirely clear what happens now in Libya. The National Transitional Council hopes to oversee provisional and then full elections in the coming years. But unlike perhaps Tunisia and Egypt, there was no functioning government whatsoever in Libya and that will take time and perhaps more turmoil to achieve. There was no uprising and no violence and even if there was there would neither be the technology nor the openness which would have allowed it to be reported to the world. In this case there was just death on train or not according to some reports. What follows the demise of one Kim is not entirely clear although it will involve another Kim, that is Kim Jong Un, his son. Whether or not he will be anymore open to the West than his father or his father before him will only become apparent in the coming months and years. In Syria, the situation is growing increasingly violent with attention focused on the actions of forces loyal to Bashar Assad and the increasing numbers of those defecting to the opposition. It is reported that as many as 5,000 people have died in the violence, how many more will die before the current situation changes? In Zimbabwe, Robert Mugabe faces elections. In 2008, elections, which were widely viewed as rigged, were followed by violence before a fragile power-sharing administration was hammered out with opposition figure Morgan Tsvangirai. Will that power-sharing administration survive? Might Tsvangirai’s Movement for Democratic Change obtain a majority? Or will Mugabe conspire to remain in power? In Yemen, Ali Abdullah Saleh has for months pledged to step down ever since he was the subject of an assassination attempt at his palace in June. He has signed a power transfer deal but will that herald a new era in Yemen or merely transfer the power of one autocratic leader to another in Abd Rabbuh Mansur al-Hadi? Email “Gaddafi, KJI, Mubarak and Ben Ali: why 2011 was a bad year for dictators ”. Feedback on “Gaddafi, KJI, Mubarak and Ben Ali: why 2011 was a bad year for dictators ”.